Apologies to Ian and Julie the owners of our last campsite Sunnyside Touring site in Buncaimbe, Arisaig. Carol forgot to enter her review on the last blog - the score was 11/10! - Yes we think we have found our ideal site: perfect location, tip top facilities, a lovely small shop selling local produce and gifts,and within walking distance of a pub/restaurant. We either need to downgrade everyone else or award + marks to Ian and Julie. Today is another travelling day so not much to report. Set off to Oban mid am. Scenic drive following Loch Linnie on to Fort William where Ben Nevis dominates the view and still has snow on it's peaks. On any other day the view with loch, mountain and forests would knock your socks off but we've seen better up north and they are still in our memory. We reluctantly left Arisaig in hot sunshine so was disappointed to hit rain after Fort William which continued right until we arrived in Oban. The ferry from Oban with the sun trying to break through looked fantastic sailing country. We stop to let a hoard of cyclists on at Colonsay before arriving in Port Askaig, Islay at 7.40pm. We get a quick exit from the ferry as Carol has booked an opulent night at a top B&B and we need to rush to catch last sitting for dinner at the Bridgend Hotel. Get to Skerrol House at 8 pm-ish -quick freshen up and change of clothes - on to bikes-peddled as fast as we could -managed to get there 8.30pm to find a table ready for us - phew! We order the "special order" crab souffle (allow 15 minute wait) in order to get that all-important beer down. Had a lovely meal in nice restaurant dining room surroundings and cycled back uphill all the way -Carol motored back and couldn't understand why Graham took so long! The Country House B&B is delightful! Set in it's own grounds overlooking lovely countryside. Comfortable king size bedroom with ensuite bathroom with a bath! Carol enjoyed a long soak and the luxury of drying her hair with a proper hairdryer not an underpowered wall mounted one as found on most campsites. Graham doesn't understand what the fuss is - he never has any such problems! In fact on reflection the only thing different about the hotel is a bath otherwise we have the super kingsize bed/ensuite etc in Rex .-umm food for thought. 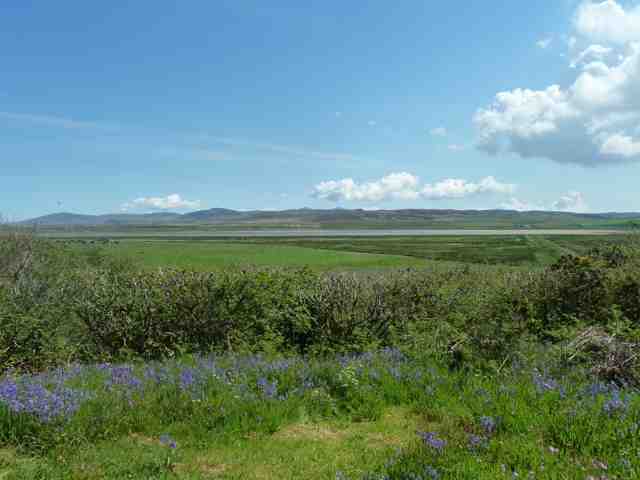 After a superb breakfast we set off for Lake Gruinart -a RSPB reserve in the north of Islay. The weather is a 22C glorious warm sunshine. Graham was hoping for some serious birding so was disappointed to discover that most birds that inhabit the lake area prefer to stay away when it is so hot! His ambition of seeing Eagles have been seriously thwarted. We took a leisurely walk through a woodland trail where lots of wild flowers were in bloom: bluebells, primroses, celandines, anemones, cow parsley and lots of other white, pink and blue flowers we don't know the name of (where is that botany book). 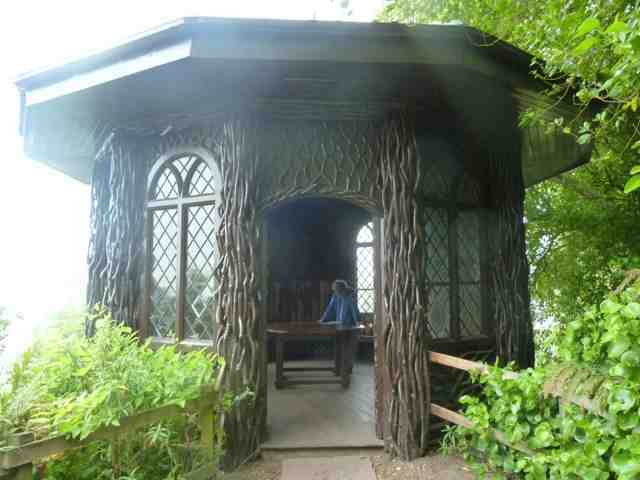 We also sat in a Hide whilst Graham looked wistfully at the practically bird-less lake. After a rather birdless visit we decided to head to a beach for lunch. It didn't look far. Now, the best way to travel around Islay (pronounced "eye-la" BTW) is by bike: the road are abs-o-lut-ely terrible. Poor Rex creaks and groans over every pothole. How can this be? 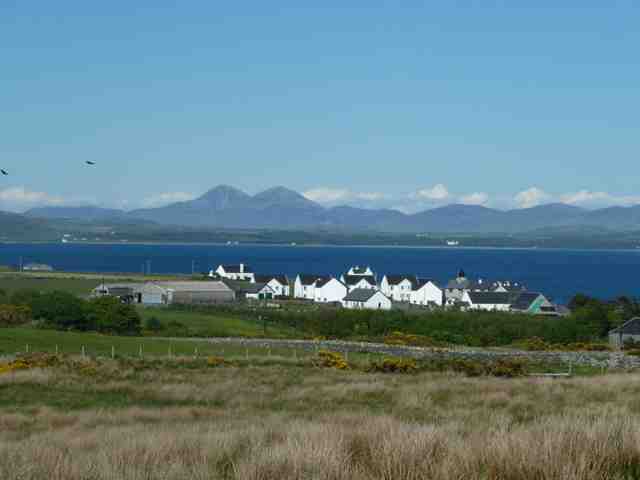 A hotel on Islay costs more than inner city London - no, really, it did!) They are are full, as are the restaurants. There are a lot of visitors eating and staying on the island and paying a lot of money - where is it all going? Our next door van-ners - Norman and Yvonne- think the roads are even worse than Poland. 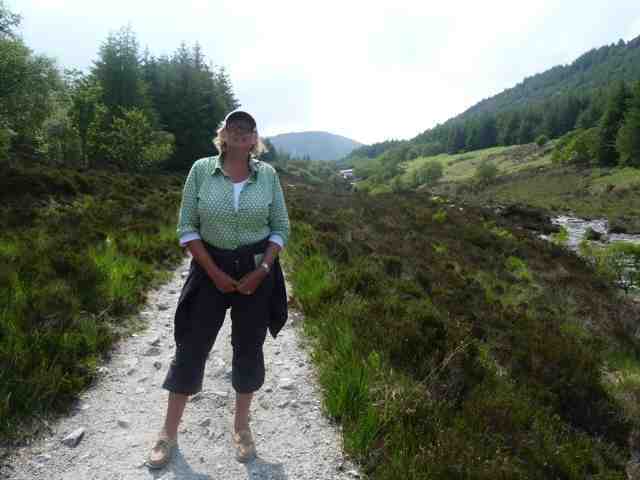 We took the single track potholed road up to Sanaigmore west of Loch Gruinart. We parked up near to a rather poignant memorial commemorating 241 Irish emigrants fleeing the potato famine in 1847 who were drowned off the coast when their ship heading for Canada sunk. The beach was another millionaires isolated beach for most of our visit. Graham saw more birds on this than at the reserve. 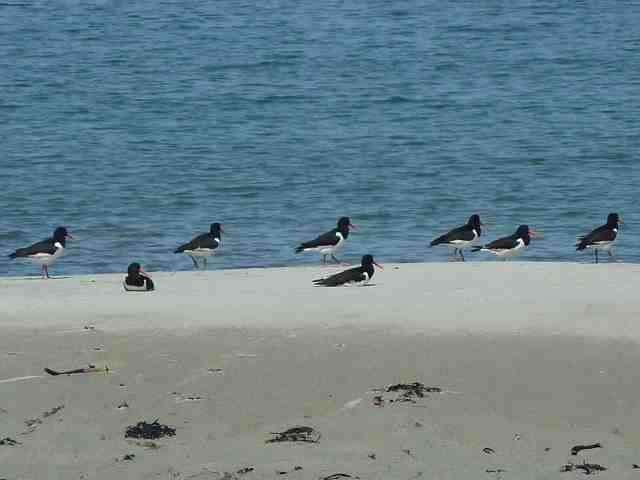 Just oystercatchers for company on this beach. We then arrived at our Campsite in Port Charlotte (named by its founder Walter Frederick Campbell in 1828 after his mother). Port Charlotte is generally agreed to be Islay's prettiest village and it certainly appears that way-whitewashed rows of pretty cottages overlooking the bay. Another cracking day and Carol wants to see the "singing sands" (Machir beach). Graham has now refused to drive Rex on anything but "the main road", on which the remote beach is not. The tourist cartoon map shows a road leading straight from our campsite to near the beach, and shows horse riders from the end of the road to the beach which we take to be a bridle path. We decide to cycle the 4 miles to the end of the road and then walk to the beach from there. The start of the walk. Our target beach is the next one to the right - or so we thought. 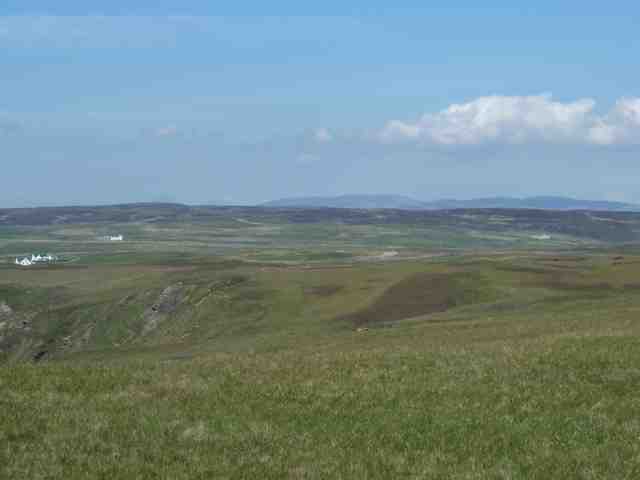 We walked up cliffs and down cliffs, through peat bogs and climbed over several gates as there did not appear to be a defined track. After 1.5 hours with nothing but feral goats for company we reached an impassible gorge- the famous sands were tantalisingly seen just around the next bay! We gave up and stopped to have lunch before we admitted defeat and turned back. Ah well, at least we had seen the beach if not actually reached it. Our company for the duration. Wait a minute - what's that on the hill overlooking us? - a couple walking on a defined path! 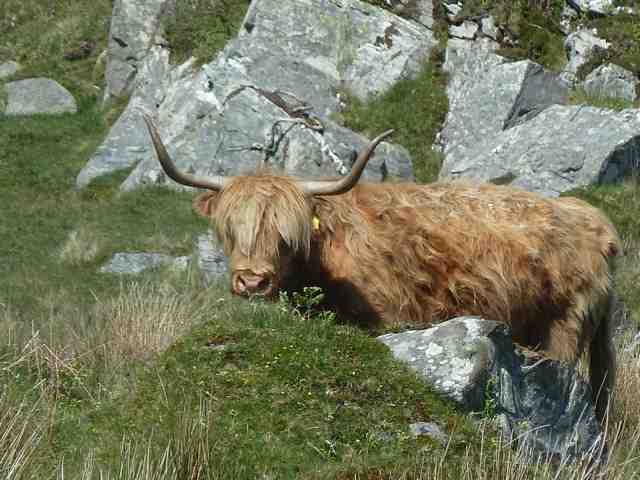 We scrambled up the hill, over another gate and emerged near to the surprised couple. Yes they have followed the easy path from the farm a few yards from where we set off! We followed the defined path for a few yards and emerged on to Machir beach - ah-ha, at last! We took the easy track back and were back to a farm and the bikes in 40 minutes - couldn't believe how easy it was. Along the route Carol cooed and cooed over the baby animals seen on route. The farmers here are incredibly tolerant towards walkers roaming all over their land and some actively promote it - all they ask is you follow the Scottish country code and keeps dogs on leads. There is a big emphasis on the balance of the environment on the islands. Farmers are compensated (for example) to delay a harvest if it means supporting wildlife. A picturesque bike ride back to the site and a welcome drink at the end of it! We decided to end the day by going into Port Charlotte to the hotel where we had a drink last night -the bar meals of local langoustine looked fab! -however we had not anticipated the demand and arrived to discover no tables left! There followed a silent walk back to the site and the reheating of a ready meal! Ah well -think of the money we saved!! 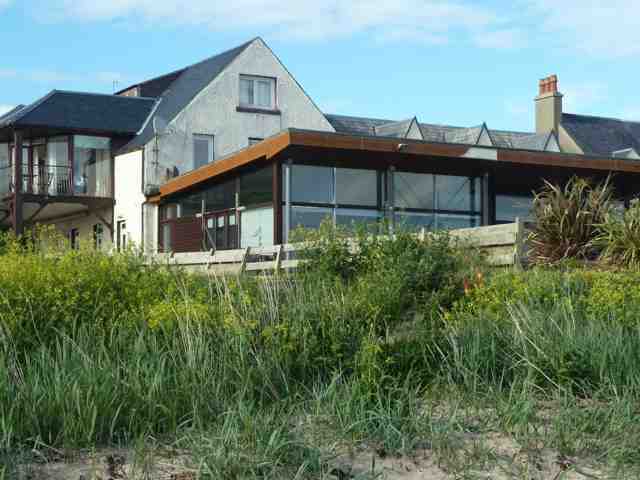 Rating for Port Mor 9/10- great location,lovely community cafe/gift shop with friendly staff. Changing rooms reminiscent of school changing rooms! Tomorrow we hope to visit The Oa. We set off for the Oa late am -another leisurely start! 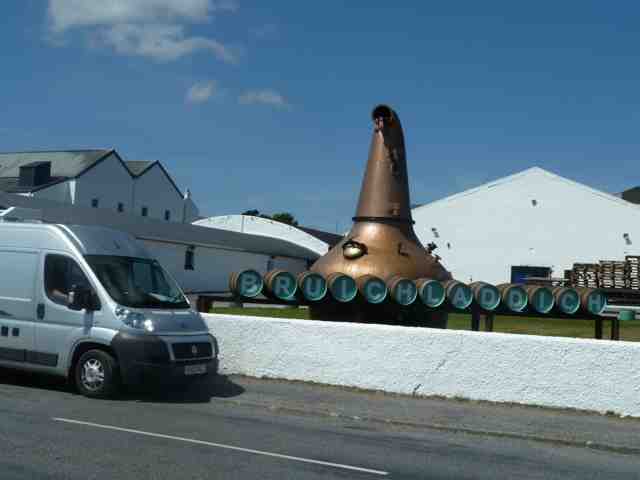 Our first port of call was the Bruichladdich distillery shop - just a few miles out of Port Charlotte. Carol had a G&T (and mine - Ed!) with gin distilled from there whilst we dined in Bridgend so it felt rude not to call in and buy a bottle. We enjoyed a tasting -with ice, lime and tonic- very refreshing! in the shop. Charmed by the generous hostess behind the shop bar we also bought some small bottles of whisky for gifts and some lovely glasses. We spent some time talking to a couple from Vancouver, Canada, who were on a cycling tour for 3 weeks. We then continued on to Bowmore but did not visit the distillery. Bowmore appeared a lovely spot with picturesque cottages. small shops and a small harbour. 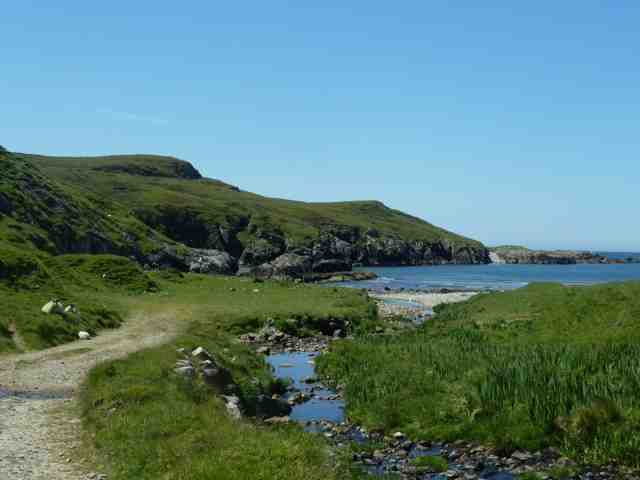 And then progressed along the single track road (poor Rex) on to the Oa (pronounced "O") -which is is a nub of land south west of Port Ellen. There is a RSPB reserve and a famous monument "The American Monument" erected by the American National Red Cross in memory of those who died in 2 naval disasters in 1918. One ship was torpedoed by a German U-boat and another boat was shipwrecked in the same year. Several hundred lost their lives. The monument is ginormous in the shape of a lighthouse. Inscribed "On Fame's eternal camping ground,their silent tents are spread, while glory keeps with solemn round,the bivouac of the dead". We parked in the car park just before a farm -presume for the RSPB reserve. 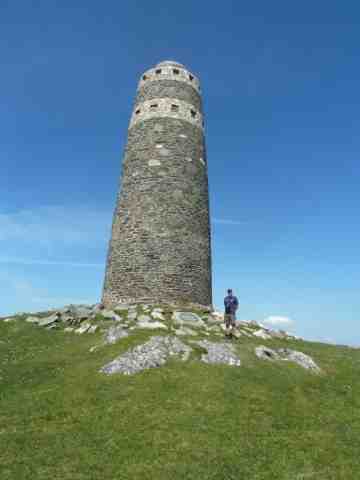 We then walked up to the monument and then followed a circular trail around the reserve. 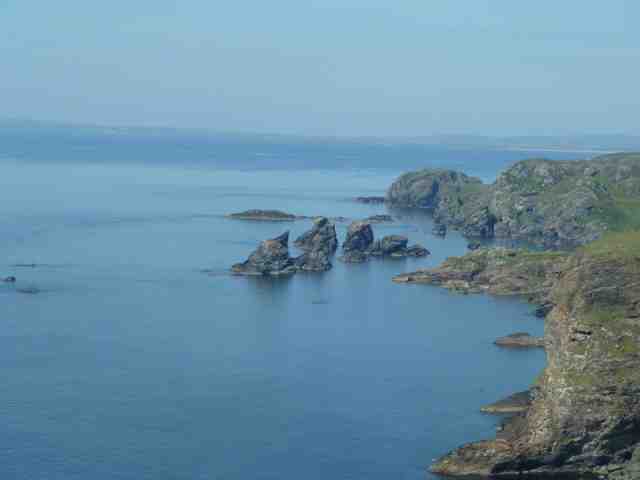 The weather was "scorchio" and the sea was again a millpond, we hope this shot captures the stillness. Several groups of Gannets flying in perfect V formation inches above the sea, going NE was a great sight (not in pic). We had intended to stay the night at a farm site in nearby Kintra but on speaking to another couple who had spent the night wild camping in the carpark we decided to do the same. 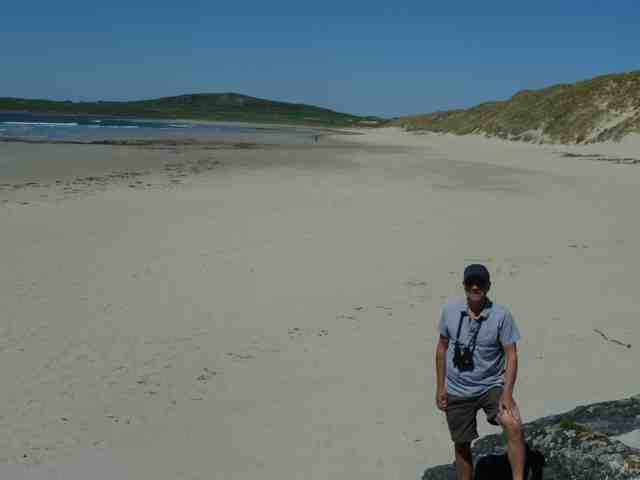 Graham would then get more time to try to spot the elusive golden eagle! By early evening we were joined by another campervan so the 3 of us settled down for the night. No eagle but a massive sub surfaced for an hour or so early in the evening. Of the 3 couples staying the night in their respective vans , the men were all called-Graham! -spooky. 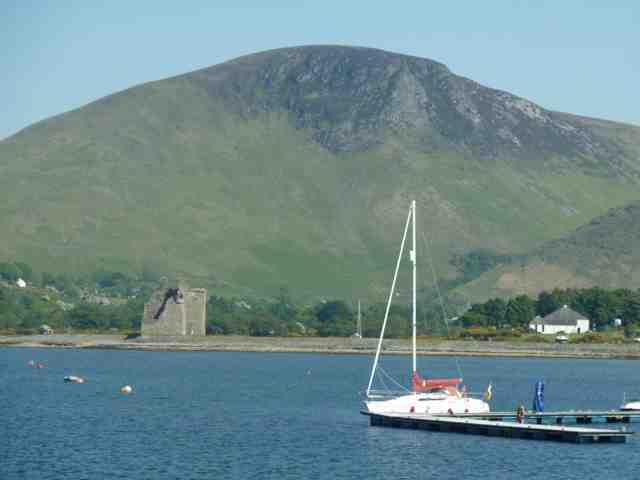 Today we are heading over to Arran. 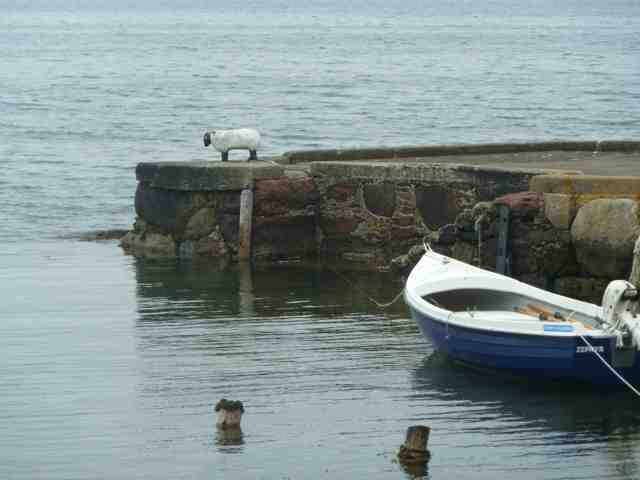 We travelled to Port Ellen ( named after Walter Frederick Campbell's wife in 1821! ) mid-am and arrived in good time. We took a stroll along the seafront to kill time. The place was littered with young people clearly nursing hangovers and looking sleep deprived-some still clutching remnant boxes of beer. 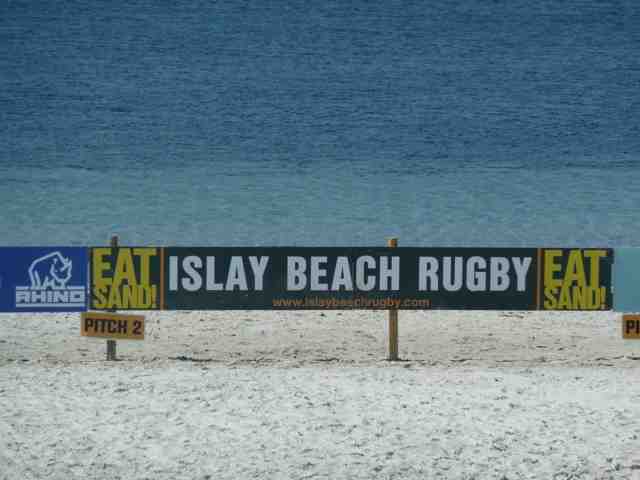 Yesterday was the annual Islay Beach Rugby Tournament-followed by evening celebrations. The remnants of beer tents, campsites, food stalls etc were being cleared away. This clearly was a serious event - the board with the knock-out round scores was still in place. There were 32 teams from all over Scotland, even teams from Royal Navy bases and as far away as Moffat. 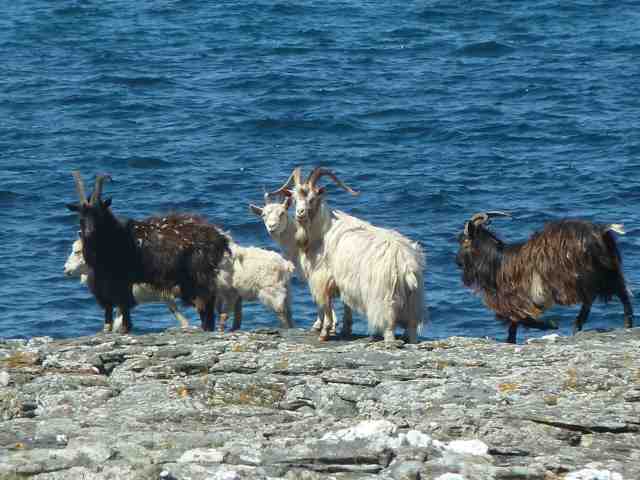 However we could not work out who won, and neither could the returning supporters in the ferry. Think we may have a lively ferry crossing to come! The logo was "Eat Sand". Actually the rugby crowd on board were no trouble at all! A quick poll concludes that a tinnie of Tennants is the beer of choice for the morning after. We arrived in Kennacraig on the top of the Kintyre peninsula, first off the boat with about 20 cars behind us. Graham guessed the way at the T-junction because the "sat nav" wasn't quite ready and is not at her best under pressure. 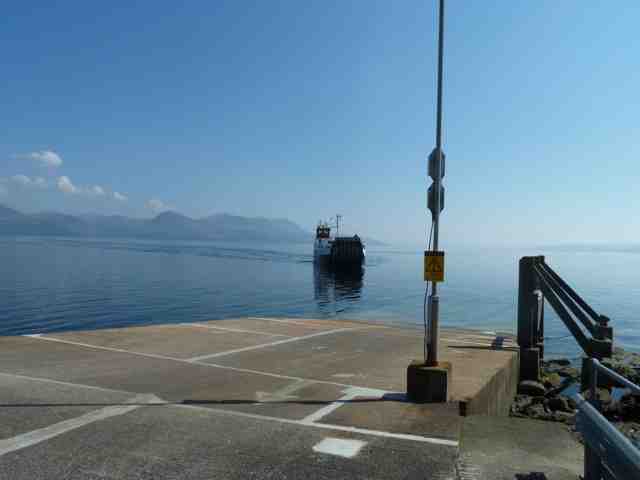 We ambled the 5 miles across to catch the ferry in Claonaig to take us to Lochranza in north Arran. This is just a lovely drive through picturesque green countryside and tropical plants. It would be great to bike. The 4 mile crossing was another sunny, calm small ferry affair. Just lovely. I hope this shows how calm the water was. 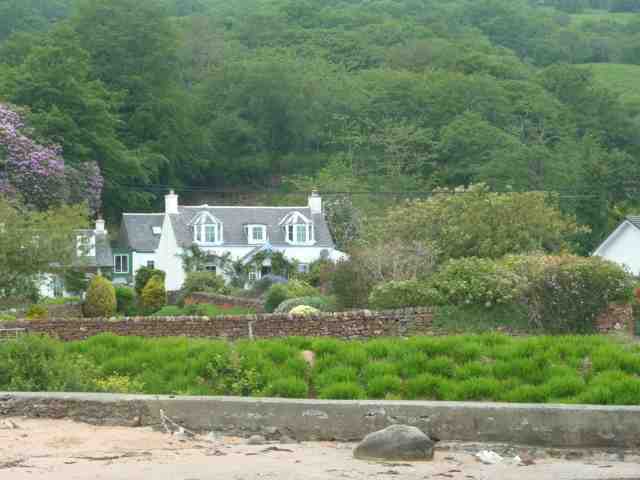 Lochranza appeared a charming place with beautiful cottages overlooking the sea, a ruined castle and a distillery. Our campsite is just along from the distillery, overlooking a golf course in a lovely countryside setting. 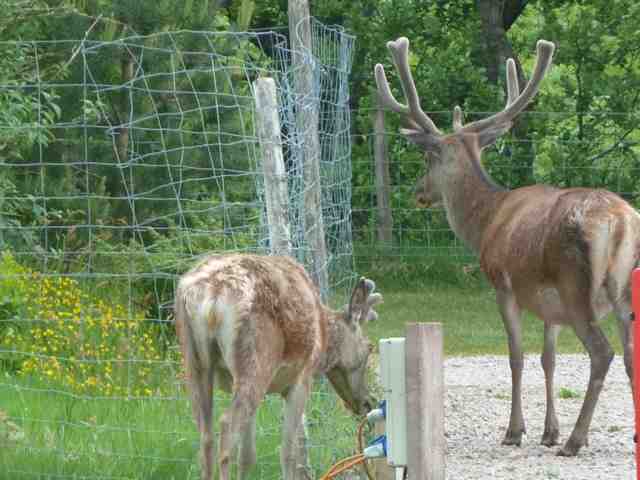 As we drove in to the site we were surprised to see a stag just sitting alongside one of the campervans! -apparently the site is visited by deer daily -they rut on the golf course and return to rear their young. The campsite is their territory -they tolerate their camping visitors! As Graham was filling Rex up with water a couple in a nearby caravan called me over for a glass of wine. 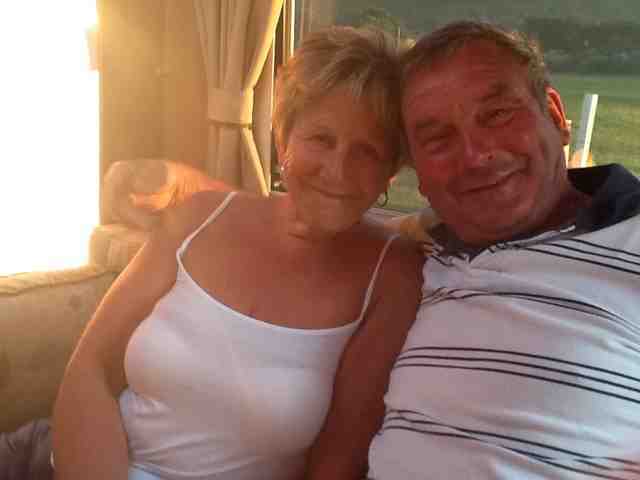 They introduced themselves - Mike and Jackie from Swanland, East Yorkshire (a few miles from our home town of Beverley). Graham came over after hooking up Rex and recognised Mike Beadle from the old rallying club. Mike was one of the top caravan rally drivers in the UK. Yes, this is rally driving but towing a caravan. One mistake and you sweep the remaining bits of plastic up with a brush. One beer led to another and we stayed on for several more drinks and joined them for a BBQ! - such generosity! As we ate we were joined by a handsome stag who was partial to a bit of salad. It was also our first encounter with the famous scottish midges and eventually it got too much. Now you wouldn't expect a top caravan rally driver to tow a little caravan would you? No. We completed our evening in their big, double wheeled, posh caravan. Great evening - thanks Jackie and Mike. There may be sore heads tomorrow. Today started rather misty, cool, windy, and hungover. We decided to ignore Mike's comments regarding the steepness of the hills and cycled to Corrie, the prettiest village on Arran. After a couple of miles of a constant steady climb and one light on the battery already out, we (Graham) were starting to regret our decision! They say that Arran encapsulates all of Scotland in miniature: In the north, the highlands; in the south, the prosperous lowlands with its victorian resorts. Well, I've just cycled up Ben Nevis... against the wind! We meet a couple walking a tandem bike up the other side and they encouraged us to continue as it was all "relatively" flat from thereon. Corrie was indeed pretty with a small gift shop where Carol got her book on wild flowers (better late than never!) and a pub which we ignored - we'd seen what hair of the dog does on the ferry. Interesting sculptures on the seashore in Corrie. We had lunch in a sweet tea room attached to Corrie Golf club - which also appeared sweet! With legs braced for the other side of the mountain to cycle up we reckoned there was still capacity left for a walk up Glen Sannox. No eagle sadly but we didn't leave empty handed as the fauna and variety of trees made the trip worthwhile. The water in the babbling brook tasted better than out of the tap. Then onwards and upwards literally again for a couple of miles (Newtons law: each upward has an equal and opposite slope on the other side), before a great freewheel back to Lochranza. We stopped by the distillery shop and purchased yet more whisky related gifts - well we are keen to support the local economy! 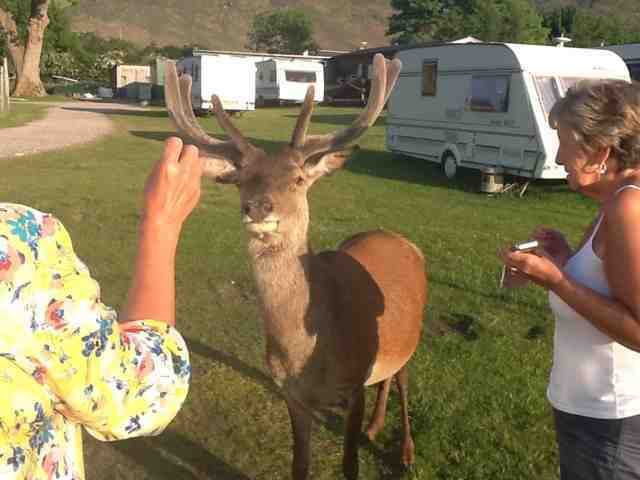 Then back to the campsite where we saw a "do not feed the deer sign, as it makes them aggressive" - oops! Again the midges arrived in strength and we retreated in to Rex and battened down the hatches for dinner. Rating for Lochranza site -9/10. A fabulous setting with resident deer! Good facilities-unfortunately the nearest shop is 7 miles away. 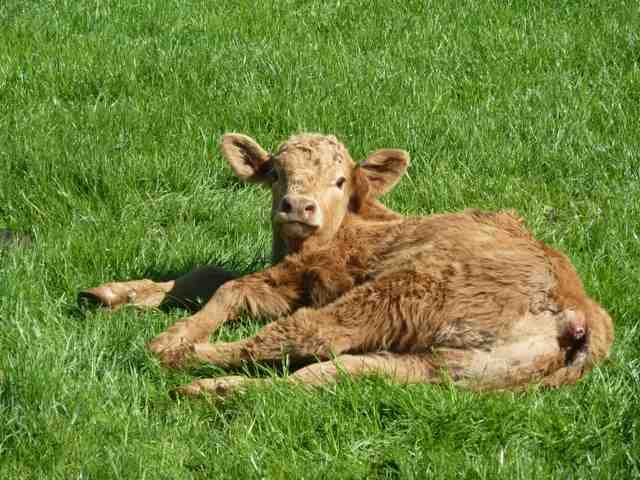 Tomorrow we head off to Kildonan in the south. Oh dear the weather has turned! -woke today to rain and mist. We had a leisurely breakfast, packed up and set off for South Arran - 11.45am - probably our latest yet! 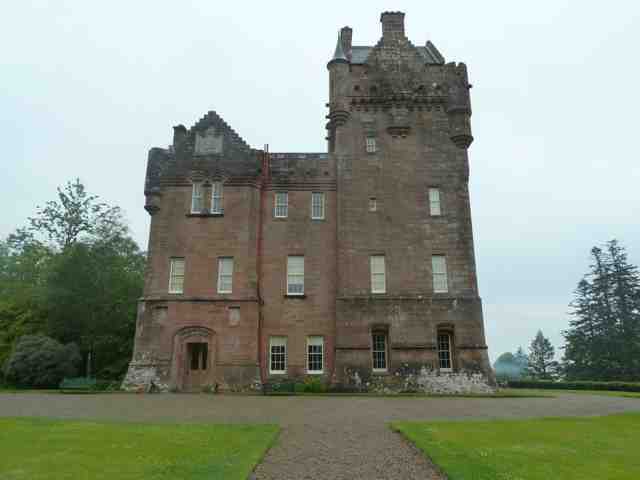 Rain all day calls for a stately home visit and luckily Arran has one: Brodick Castle. Graham had a big grin on his face when he learned that our NT membership extends to Scottish NT properties too. Ha ha. We are £24 up already. As the weather was a little improved - light drizzle- we walked around the gardens-a mix of formal walled gardens and wooded informal garden with lots of impressive old trees and many rhododendrons, azaleas and other colourful plants. In the heart of the wooded area was bavarian style summerhouse lined entirely with pine cones collected from the estate, this was built by the 11th duke to make his wife Princess Marie of Baden feel at home. Graham was more impressed with the ice house -where ice brought over from Scandinavia and North America was stored to make a freezer like environment. The house even had a little jetty where the ice was landed. Imagine the logistics! Our first impressions of Kildonan was not too favourable - admittedly we did arrive in rain! We walked over to the Kildonan Hotel next to the site -our mental picture of a wood panelled traditional scottish hotel with roaring fires quashed as we entered the rather well worn slightly tatty looking building -we booked a table for dinner but with no high hopes of a gourmet feast -we may be proved wrong-but I doubt it! was reminiscent of rural italian restaurants we visited in the 90's -full of random objects - a plaster bust of a pharoah, paintings and other ornaments -just no tv in the corner! The waitresses were chatty and friendly, the food quite acceptable. Carol had some local mussels and Graham the biggest scallops we have ever seen! There were 8 covers; a french couple, a couple on business (we think as they asked for the drinks to be paid separately), an eastern european couple and us. Non-stop rain all night and not much better in the morning. There is only one thing to do on a rainy last day - hit the shops. So it's off to the big city: Brodick. We examine the bus time-tables. The one on the bus stop says 13:57 and the one in the campsite says 12:52. We missed the 10:00 so decide to see if the 12:52 turns up. A chap from the hotel wanders up and says the bus goes at 1pm, so they're both wrong. He turns out to be Portuguese and is training in hospitality at the hotel. He tried Spain and Portugal but applied here and got the training job - we couldn't work out whether it was because of local high un-employment or because he fancied Scotland. Most of the shops in Brodick are tat( Graham) designer homeware(Carol), but there is a cluster of artisan shops/cottage factories a mile out, on the way to the castle so we walked there and Carol stocked up on beer, chocolates and aromatics as gifts - job done. The weather improved as we waited for our return bus and we enjoyed views over the bay to Brodick Castle and Goatfell. So we spent a pleasant sunny evening on our last evening in Kildonan. Stange - but no midges at all. Same island but on the coast. We retire early for two reasons; (i) we have to be up early in the morning and (ii), the Apprentice is on. Tonight they are trying to sell accessories at the NEC caravan and motorhome show (which we went to in October). Now, caravanners are, shall we say, careful with money, and by and large, old and a gruff lot so this could test their self professed "selling" abilities. Just in case the birders think I've forgotten them, Kildonan was pretty good for birds, but nothing too exotic. We saw: Oystercatchers (they are EVERYWHERE), gannets, terns, gulls, rock pipits, pied wagtails, ringed plovers, turnstones, shelducks, eider ducks, shags, cormorants, swallows as well as the usual garden varieties. Rating for Sealshore campsite 7/10. We were a little disappointed with location -although on a beach -the beach was not the most attractive covered in vast quantities of pungent seaweed, flies and rocks. 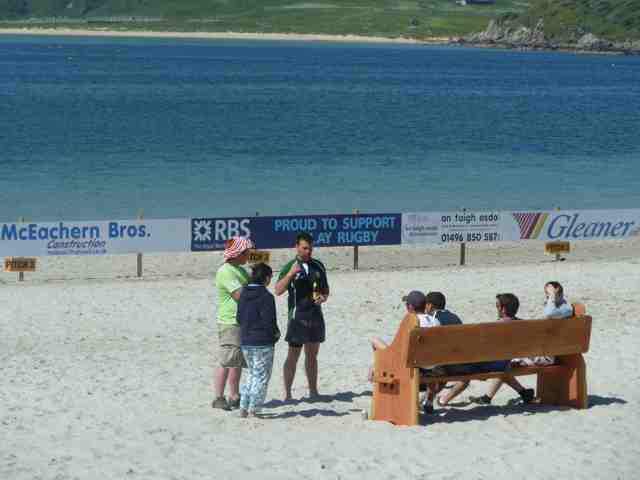 We have been spoilt by our experience of beaches on the east/west mainland coasts and the western isles! 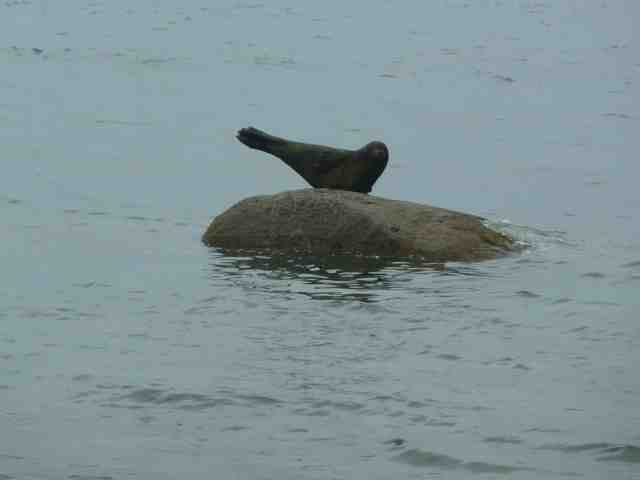 The hinted at seals did not materialise. Facilities basic but clean. 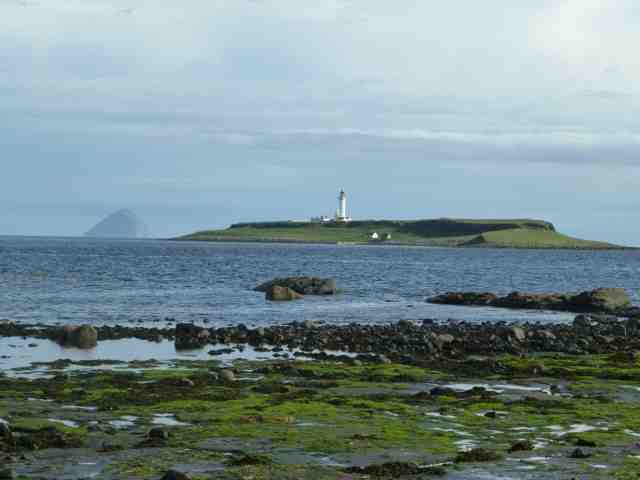 Tomorrow back on the ferry to Ardrossan and onward towards home -we're not sure where we will overnight stop at present. All good things must come to an end.....back to the french lessons. Umm-where do you think we may go next?